I am a Sweetest Families Ambassador for Hershey Entertainment and Resorts for 2019. This post is part of that partnership. All opinions are my own. Hersheypark is ready for spring with the 2019 season of Springtime In The Park. Three weekends in the spring you can ride over 50 Hersheypark attractions including 13 roller coasters. Here is your complete guide to Hersheypark Springtime In The Park. I know that after you visit Hershey in the spring you are going to want to make sure you have a Hersheypark season pass. 3 visits and it pays for itself! Your season pass also will cover Hersheypark Christmas Candylane, Hersheypark In The Dark and all the fall fun in Hershey Pennsylvania. Don’t forget to start your Hersheypark fun at Hershey’s Chocolate World. What are the dates for Hersheypark Springtime In The Park 2019? What time is Hersheypark open for Springtime In The Park? Springtime In The Park hours are are 10 am to 9 pm on Friday, April 19, and all three Saturdays. The Park is also open for three Sundays, including Easter, from 10 am to 6 pm. How much do tickets cost for Springtime In The Park? Admission to Hersheypark for Springtime In The Park is $38.95 for ages 9 to 54 and $27.95 for ages 3 to 8 and ages 55 and older. Children 2 and younger are free. Keep in mind that Springtime In The Park is INCLUDED in your Hersheypark Season Pass. When was the Hersheypark carousel built? 2019 marks the 100 year anniversary of the Hersheypark carousel. Springtime in the park will be your first time this year to ride the historic carousel. The Carrousel, built by the Philadelphia Toboggan Company in 1919 and remains one of the oldest carousels in the country. All of the 66 hand carved horses are still original and are lovingly restored by a team that wants you to treasure the ride as much as they do. 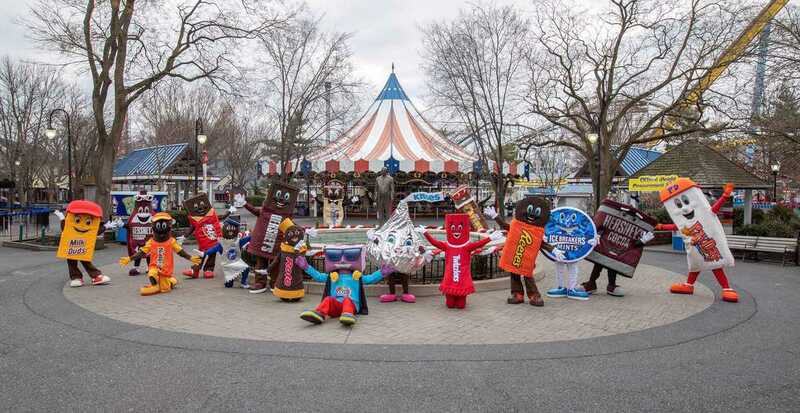 Who are the Hersheypark characters available for photos in the park? Are there new food options at Hersheypark in 2019? You know I love food and Hersheypark food is some of the best in the theme park business. New for 2019 look for an all-new Chick-fil-A food truck. The Outpost, a dedicated gluten-free and nut-free stand in the Pioneer Frontier area, will feature a redesigned menu for guests with food allergies. If you love milkshakes as much as I do you are going to be sure to try the new King Size Milkshakes at Simply Chocolate dessert shop inspired by the Carrousel and Reese’s Cupfusion. I am sure they will be very Instagramable. Be sure to tag #HersheyparkHappy so we can all see what you are eating! Can you drink beer or wine in Hersheypark? If you are looking for a cold beer or a glass of wine, you can enjoy both in Hersheypark. In select locations there are adult beverages available for purchase for those 21+. Note that beer and wine is not included of any of the food or drink plan options. ID is always required. Where can you purchase beer and wine in Hersheypark? I am a huge fan of The Spa at The Hershey Hotel so I knew that when MeltSpa by Hershey opened, it was going to be something special. And it does not disappoint. All the luxury, sweetness and pampering of the resort spa with the atmosphere, price point and hospitality of a day spa. Hersheypark Christmas Candy lane is the sweetest place to be this holiday season. Christmas in Hershey is better than ever in 2018. Here is all the information you need to know before you visit Hershey park at Christmas. There is so much to see, do, eat and experience in the Sweetest Place On Earth. There is something for everyone in Hershey! Families to couples, singles to seniors something sweet is waiting for you in Hershey, Pennsylvania. One of our favorite holiday cookies is the peanut butter blossom cookie. Also known as peanut butter kiss cookies, this is the Christmas cookie with the soft peanut butter cookie base and a Hershey kiss pressed into it while the cookie is still warm. These kiss cookies are freezer friendly.